BETH-SHEMESH (IR-SHEMESH in Josh. xix. 41). A city of the hill-country between Judea and the coast on the southern side of Wadi Sarâar, called to-day 'Ain Shems. According to Josh. xix. 41, it was one of the cities of Dan, and according to Josh. xv. 10, it was on the boundary-line of Judea. In Josh. xxi. 16 it is named as a Levitic city. The Ark of the Covenant of Yhwh remained here for a time after it had been released by the Philistines (I Sam. vi. 9 et seq.). At the time of Solomon, Beth-shemesh was the seat of one of the royal officers (I Kings iv. 9). Later on Amaziah, king of Judea, incurred a serious defeat there. Under Ahaz, Beth-shemesh was conquered by the Philistines (II Chron. xxviii. 18). Nothing further is heard of the town, although it still existed at the time of Eusebius. Another Bethshemesh was situated in the territory of the children of Naphtali (Josh. xix. 38; Judges i. 33). 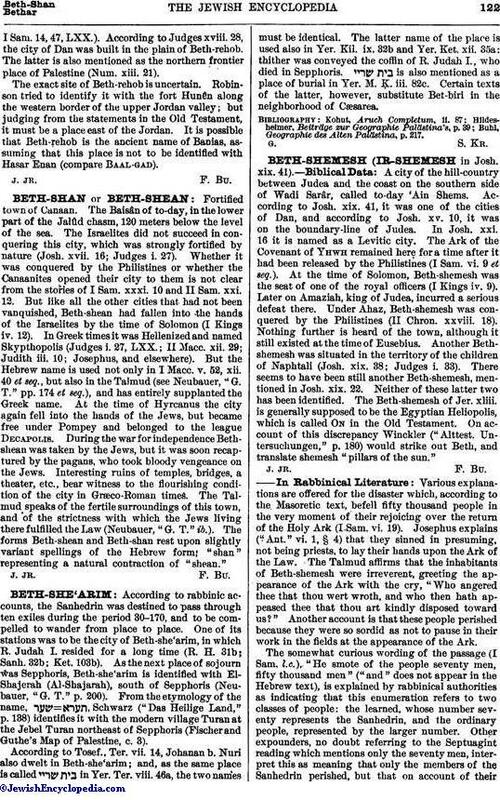 There seems to have been still another Beth-shemesh, mentioned in Josh. xix. 22. Neither of these latter two has been identified. The Beth-shemesh of Jer. xliii. is generally supposed to be the Egyptian Heliopolis, which is called On in the Old Testament. On account of this discrepancy Winckler ("Alttest. 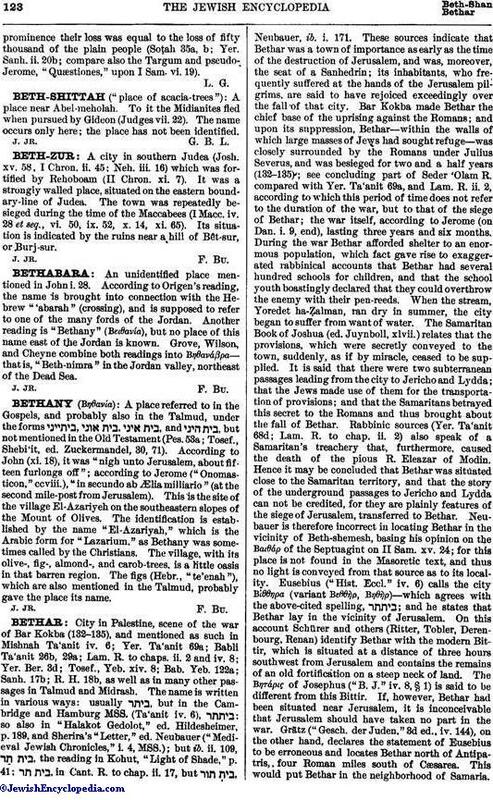 Untersuchungen," p. 180) would strike out Beth, and translate shemesh "pillars of the sun." Various explanations are offered for the disaster which, according to the Masoretic text, befell fifty thousand people in the very moment of their rejoicing over the return of the Holy Ark (I Sam. vi. 19). Josephus explains ("Ant." vi. 1, § 4) that they sinned in presuming, not being priests, to lay their hands upon the Ark of the Law. The Talmud affirms that the inhabitants of Beth-shemesh were irreverent, greeting the appearance of the Ark with the cry, "Who angered thee that thou wert wroth, and who then hath appeased thee that thou art kindly disposed toward us?" Another account is that these people perished because they were so sordid as not to pause in their work in the fields at the appearance of the Ark. The somewhat curious wording of the passage (I Sam. l.c. ), "He smote of the people seventy men, fifty thousand men" ("and" does not appear in the Hebrew text), is explained by rabbinical authorities as indicating that this enumeration refers to two classes of people: the learned, whose number seventy represents the Sanhedrin, and the ordinary people, represented by the larger number. Other expounders, no doubt referring to the Septuagint reading which mentions only the seventy men, interpret this as meaning that only the members of the Sanhedrin perished, but that on account of theirprominence their loss was equal to the loss of fifty thousand of the plain people (Soṭah 35a, b; Yer. Sanh. ii. 20b; compare also the Targum and pseudo-. Jerome, "Quæstiones," upon I Sam. vi. 19).